This wedding band is 230 million years in the making. This one-of-a-kind ring is truly out of this world, and will leave your mind blown from its overall design and craftsmanship. 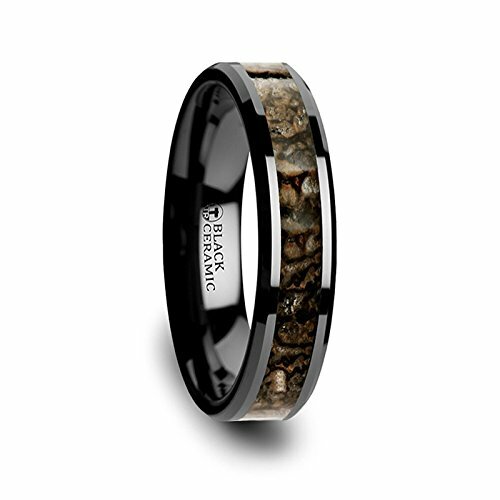 This wedding band is made from ultra durable black ceramic, which is one of the most scratch resistant metals on Earth. Speaking of Earth, the earth is where the dinosaur fossil used in making this ring were painstakingly excavated. The authentic mineralised fossil is cut and polished to a beautiful finish. The particular fossil used in this ring is a brownish earth tone. This coloring is created by the minerals that slowly replaced the bone over millions of years. This beautiful and ancient fossil creates a stunning ring when set into the center of this perfectly crafted black ceramic ring. This wedding band comes comfort-fit for supreme comfort and available in a 4mm & 8mm width. Other widths available upon request as a custom order. Please be advised that your ring may differ from the picture. This is actual fossil used in creating the ring and each piece and section of fossil can differ. Truly Free Lifetime Sizing and Lifetime Warranty on all tungsten rings, no exchange|sizing fees, which are charged by other retailers.